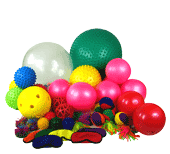 A range of items to encourage the fundamental use of senses using both hands and feet. The tactile items also promote the development of the childs verbal description of items being touched. Sight and sound games could also be used to encourage memory, listening skills and spatial awareness.